The first Mitsubishi Buy Online customer has taken delivery of his new Mitsubishi three weeks after ordering his Mitsubishi ASX on his smartphone while on a coffee break at work. Antony Deane purchased his Mitsubishi ASX 3 – the first brand new car he has ever bought – via Mitsubishi Buy Online after noticing the new web-based buying portal on the Mitsubishi Motors in the UK website. He completed his purchase in less than 20 minutes. 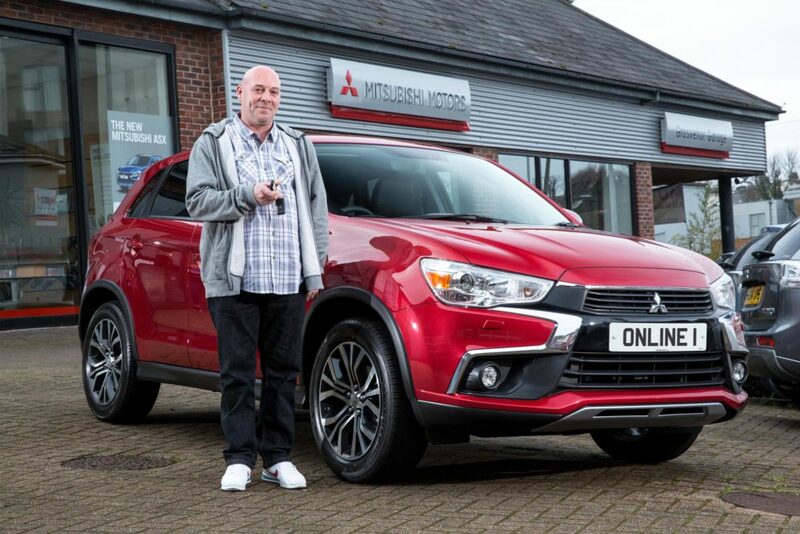 Antony, 43, was then able to chat online with the dedicated Mitsubishi Buy Online support team to determine the delivery of his Mitsubishi ASX – collecting his Orient Red Mitsubishi ASX 3 only three weeks later from Grosvenor Garage Mitsubishi in Tunbridge Wells. Mitsubishi Buy Online also offers the option of home delivery. Antony also took advantage of the option to part-exchange his existing car via the trade-in valuation facility offered by Mitsubishi Buy Online, simply dropping his previous car off with Grosvenor Garage Mitsubishi and driving away in his new Mitsubishi ASX. He also has a Mitsubishi Service Plan, ensuring his future servicing requirements are hassle-free. Service plans and accessories can all be added at the time of placing an order on Mitsubishi Buy Online and integrated into finance payment plans. On his purchase, the father-of-four from Crawley, said: “I knew I wanted the Mitsubishi ASX and when I saw that I could actually buy it through the website, I decided to save time and go via Mitsubishi Buy Online. It did feel a little strange at first, as one minute I was having a coffee and the next I was buying a car on my phone, but it was all very straightforward and really well explained. Developed in conjunction with leading online vehicle retailing specialist, Rockar, Mitsubishi Buy Online allows customers to access the Mitsubishi showroom at any time of day. All current Mitsubishi models are included in the programme and customers also benefit from the same national offers that are available through the brand’s dealerships. Through the brand’s partnership with automotive auction specialist BCA, Mitsubishi Buy Online provides users with a competitive and simple part-exchange facility that can also predict future trade-in values. Test drives can also be booked at dealerships before customers finalise their purchase.